The condition we call ich is one of two common marine aquaria diseases caused by protozoan parasites. Left untreated, ich can spread quickly among all the fish in your tank. Ich is treatable; in many cases infected fish make a full recovery. Acting quickly to treat ich is the key to ensuring successful recovery. Ich is one of the easiest parasitic aquarium fish diseases to identify. This disease manifests in the form of small white spots on the fins, gills and bodies of affected fish. Fish that are infected with ich may exhibit behavioral changes including loss of appetite, labored breathing, clamped fins, reclusive behavior and rubbing against tank objects. As the disease progresses, the number of white spots on the fish will increase; the fish will grow progressively weaker if the condition is left untreated. Freshwater aquarium ich is caused by the protozoan parasite Ichthyophthirius multifiliis. Marine ich is caused by a different parasite by the name of Cryptocaryon irritans. Other factors, including stress levels in your fish and the conditions in your tank, also contribute to the development of ich. The ich parasite is most likely to affect fish that are already weakened as a result of stress or disease. The parasite thrives in tanks where the water quality is poor. 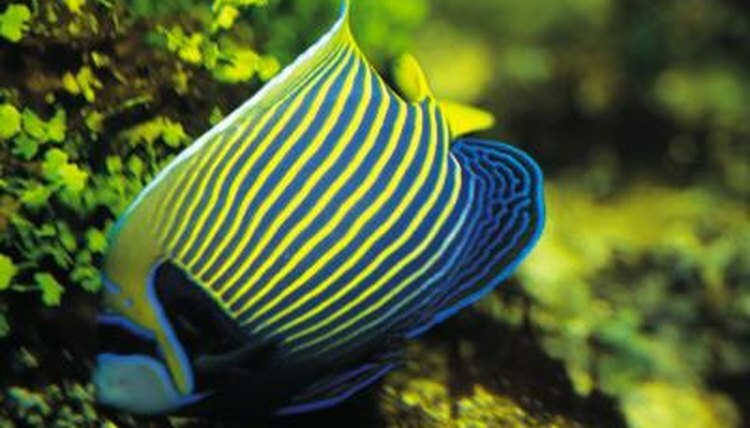 The key to preventing this disease in both freshwater and saltwater tanks is to maintain high water quality and to ensure that the basic needs of your fish are met so they do not become stressed. In freshwater aquariums, the parasite responsible for ich starts out as a free-swimming organism until it finds a host body to infect. After attaching to the host body, the parasite feeds on the bodily fluids of the infected fish, growing into a visible white cyst. Over time, such cysts drop off the host body and attach to tank walls and other objects, where they quickly reproduce. Marine ich, Cryptocaryon irritans, follows a similar life cycle but may remain encysted on tank walls and objects for a longer period of time. Once cysts break open, both freshwater and marine ich spread quickly through the tank. Both freshwater and marine ich respond to medications. Some of the most popular medications for this disease are copper-based, having active ingredients like copper-sulfate or soluble copper salts. Medications with the active ingredient potassium permanganate may also be effective, but this treatment is typically recommended for soft-water fish and outdoor ponds. Other medications commonly used to treat this disease include formalin, malachite green, acriflavine and methylene blue. When using medications to treat ich, it is important to read and follow dosage instructions carefully so you do not poison your fish. You may also need to remove the activated carbon from your filter because it will interfere with the medication. In addition to medications, several alternative treatment options may be effective against ich. One option is to increase the temperature in your tank in order to speed up the life cycle of the parasite, causing it to die more quickly. This treatment is effective only against the freshwater form of the parasite. Raise the temperature slowly over a period of several days until it reaches about 80 to 82 degrees Fahrenheit. Aquarium salt is an alternative treatment option effective against a variety of aquarium fish diseases. Dose your tank with 2 to 3 tablespoons of aquarium salt per 5 gallons of tank water. Maintain the salt treatment for three days beyond the point that your fish no longer display white spots. Why Does My Fish Float on Its Back When It is Alive? Why Do White Bubbles Form on Fish?